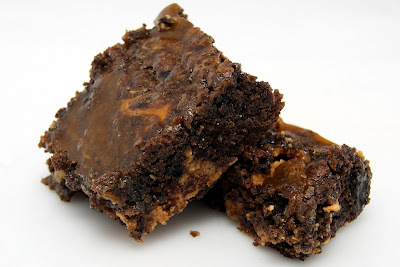 Salted Caramel Peanut Butter Swirl Brownies. Try saying that three times fast! If you can, I think you've earned your brownie! Well, I guess it's only appropriate to wish the interwebs a happy Valentine's Day! I mean, once again I am alone on Valentines Day, but only romantically. Seriously boys, when I are you going to realize that I can bake? Yeesh! However, I am not alone. I have wonderful friends here in Seattle and family back in Michigan who I know love me and they should know I love them right back. That, and I just polished off a box of conversation hearts (and a bowl of vegetarian chili and some middle eastern flat bread and… oh, I should probably stop talking now) so I got some loving words from them. While today is technically V-Day, I celebrated yesterday with the girlfriends. Christine, Julie, Katrina and I had a girls day extravaganza in honor of the blessed holiday. It started off with a walk around Green Lake and a picnic in one of the parking lots. Next we drove on up Aurora to a unique nail salon (appropriately titled Glamour Nails) and had a three hour long manicure. With our polished fingers and toes we trotted on over to my place where we decorated red velvet cup cakes (check back for that post later) and Julie & Katrina cooked a delicious and light dinner. To complete the picture, we closed off the evening by watching Twilight. All in all, it was the perfect day and definitely the perfect Valentine's Day. However, these brownies are in no way connected to Valentine's Day. In fact, I made them a few weeks ago for a game night that I had. It was right after I accepted my new job (of which I just completed my first week today! ), most of 'the group' was in town and we pretty much hung out all day. After playing some 3 on 3 football with 5 people, it was as interesting as it sounds, we didn't want to stop hanging out and decided to have a game night that evening. Being that I am who I am, I made brownies to make the people happy. Of course they were, but they were a little rich to be paired with the soft white wines were were drinking. Don't take this as a bad thing though, they were do delicious and the caramel perfectly melted into the brownies. So if you're single today, make a pan and polish the whole thing off without worrying about anyone knowing. If you're attached, make this for your significant other and chances are, you'll make their day. Configure a large sized double boiler. Place the chocolate, the butter, and the STRONG coffee in the bowl of the double boiler and stir occasionally until the chocolate and butter are completely melted and combined. Turn off the heat, but keep the bowl over the water of the double boiler and add both sugars. Whisk the sugars until completely combined and remove the bowl from the pan. Mixture should be room temperature. Pour the mixture into the pan and smooth the top with your spatula. Spoon on some natural peanut butter and "marble" in with a knife. Bake the brownies for 33 minutes (rotate the pan half-way through baking) and check to make sure the brownies are completely done by sticking a toothpick into the center of the pan. The brownies are done when the toothpick comes out with a few moist crumbs. In a small saucepan over low heat, warm heavy cream. Do not boil. In a separate tall saucepan, combine sugar and water. Do not stir. Place over medium-high heat and bring to a boil. Cook until the mixture turns an amber color. Remove pan from stove. Add warm cream, butter, and salt. Stir gently until mixture is smooth and well combined. Pour caramel glaze all over completely cooled brownies. Allow to set completely. Cut into small rectangles and serve. Wow. These look delicious--I will make them soon. I do love brownies. Mmm...I love all these flavors combined. Glad I found your blog via Lisa! this is awesome, yum! i love salt and chocolate! glad to have found your blog!